What if Most Jobs Become Permanently Temporary? For anyone among the millions of workers, including the virtually unskilled, who need more than a low-paid and unstable temporary job, there is at least one prospect that is more painful and scarier than that combination: that their plight is going to be permanent. Indeed, their ranks are swelling. Most of the jobs recently added to the U.S. job pool are temporary—at least temporarily temporary. But what if “permanently temporary” jobs ever become the national norm, rather than the fate of only a segment of the temporary workforce that comprises approximately 2 percent of the U.S. job-holder total? Wouldn’t that be scariest of all? 2. “Temporary” jobs that are de facto permanent, e.g., José Miguel Rojo’s job packing frozen pizzas for a Walmart supplier every day for eight years as a temp, until he was injured last summer and lost his job. Either way, not a happy situation—especially when the jobs are unrewarding in every respect, except for providing (bare) subsistence. can provide opportunities for more varied experience within or between fields and thereby strengthen skill sets. On the other hand, there are the legions of underemployed skilled workers who want and need something more—including health insurance, retirement, sick leave and vacation benefits, not to mention long-term security for themselves and their families. As evidence mounts that the U.S. economy is replacing traditional secure full-time, well-paid, well-insured (health and retirement), high-skill jobs with their exact opposite, not only are minimum-wage temporary worker numbers and percentages increasing; so is the likelihood that their dependency on temporary jobs is going to become permanent. Worse, as the impact of downsizing of high-skill employment seeps downward, the unluckiest among the (formerly) middle class unemployed may find themselves, like so many unskilled, marginally educated workers buying a ticket on a packed van departing before dawn for a two-hour trip to a shot at some of the worst jobs out there. Second only to Walmart, the nation’s largest employer in 2010 was Kelly Services (which although also a supplier of high-talent full-time staff, is widely regarded as the icon of temp staffing—including by Forbes). Many stocks in the temp industry are outpacing the Standard & Poor’s 500 Index, and analysts see more gains, with almost two-thirds of ratings for eight among the largest staffing companies being buy recommendations. In a July 8, 2013 Associated Press article (by Christopher S. Rugaber), “Temporary Jobs Becoming a Permanent Fixture in US”, it was reported that, if the millions of free-lancers, short-term contract workers and outsourced consultants (many of who, are de facto temporary workers) are added to the officially “temporary” worker tallies, the “non-permanently employed” population gets bumped up to 17 million, i.e., 12% of all people employed in the U.S. Quoting Paul McDonald, a senior executive director at staffing company Robert Half International Inc. in Los Angeles, Crainsdetroit.com (source of some other data cited here) reported on May 10th, “This recovery is producing jobs on a temporary basis even faster than the last recovery,” to which he added that penetration of 2.5 percent to 3 percent is possible at some point. What if Permanently Temporary Jobs Become the Norm? 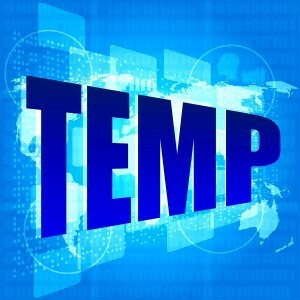 Allowing that permanently temporary and temporarily temporary (part-time or full-time) work is displacing many traditional permanent jobs—including hugely outsourced manufacturing, what would be the upsides and downsides if, at some point in the future, most jobs in the U.S. (or elsewhere) were permanently temporary jobs (PTJs)? 1. 1. Obamacare critics will argue that health insurance and health care services would have to morph into something very different from Obamacare—since they identify substantial, if not prohibitive, cost increases to employers as one factor underlying the shift from full-time, full-benefit hiring to temporary and part-time employment—if not full unemployment. Speculating on what byzantine forms of health insurance, services, legislation and forms to be filled would evolve to adapt to mass PTE (permanent temporary employment) is way above (or at least far afield from) my pay grade. 2. For those who will be stuck in underemployment or otherwise awful PTJs, life will be (even more) miserable, despite whatever truth there is in “misery loves (and is comforted by) company”—even when there’s lots more company like that. 3. 3. Among the few who have full-time, full-benefit, fulfilling jobs (FFFs), there will probably be some of unpleasant disposition who, predisposed neither to pity nor gratitude for their good fortune, will gloat. This suggests a future statistical spike in the incidence of “schadenfreude” (delight in the misfortune of others) and it’s possible further entrenchment as a cultural norm—to the detriment of everyone. 4. 4. Anyone who hates being “in a rut”, living a life with no surprises, little change, limited variety and unchanging horizons may thrive in a PTJ-based economy (assuming that gaps between temporary jobs are even more temporary). When these adventure-loving people become more satisfied as PTJs become the norm, they will serve as a happy and contented offset to everyone else (if, as a bonus, they skip the schadenfreude). …condemned for eternity, presumably unlike the rest of us, to permanently permanent pointless labor.